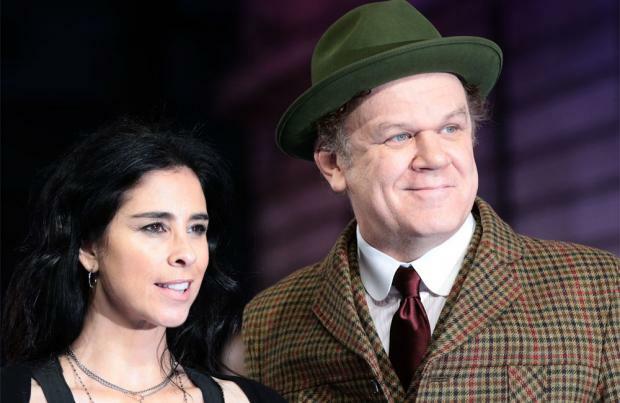 Sarah Silverman says she and John C. Reilly were able to use their "whole bodies, whole selves and whole hearts" to record their parts for new Disney animation 'Ralph Breaks the Internet'. The two co-stars reprise their role as Sugar Rush racer Vanellope von Schweetz and titular soft-hearted video game villain Wreck-It Ralph in the sequel and Silverman admits it was great that she and Reilly were able to record their voice parts together because they were able to bounce off one another in the booth. Speaking exclusively to BANG Showbiz at the 'Ralph Breaks the Internet' UK multimedia screening in London on Sunday (25.11.18), she said: "I got to record with John and we got to look into each other's eyes, it wasn't very challenging! We used our whole bodies, and our whole selves and our whole hearts to act!" 'Ralph Breaks the Internet' is the follow-up to 2012 film 'Wreck-it Ralph' and is the 57th Disney animated feature film. The plot follows the characters six years after the events of the original movie as Ralph and Vanellope discover a Wi-Fi router in their arcade and embark on a new adventure. Sarah, John, Jack McBrayer, Jane Lynch, and Ed O'Neill reprise their roles from the original film and Taraji P. Henson, Gal Godot, and Alfred Molina lend their voice talents as new additions. Sarah, John and Gal appeared at the premiere alongside directors Rich Moore and Phil Johnston and producer Clark Spencer. Gadot, 33, voiced her lines as Slaughter Race driver Shank on her own and she admits she was disappointed not to get to act with Silverman. The 'Wonder Woman' star said: "I got to work with Phil and Rich. I didn't get to record with Sarah and John unfortunately. But working with such professional, smart and creative people was super great for me and I learned a lot from them."